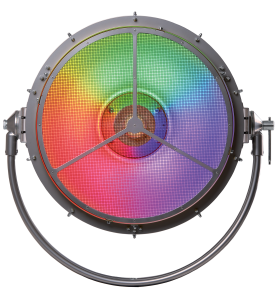 Extending the ROBE series of retro style lighting, PATT 2017 is LED driven environmentally conscious and can be a playfully colorful or adaptable tungsten white-like eye-candy effect for the stage and set – perfect for bands, television, film and general prop lighting. Lighting fixtures can be more than a practical necessity – the luminaires themselves can be a piece of art and create the mood. This fixture is based on an idea conceived by lighting designer Tim Routledge. 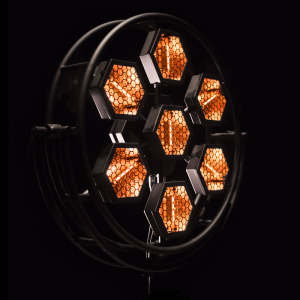 The 7x30W RGBW LEDs powerfully illuminate the seek, spun aluminium body which maximises its curves to look as good on stage as the performers it illuminates. 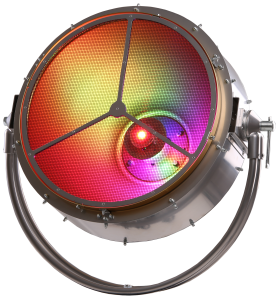 Besides controlling the complete LED cluster as one unit, it is possible to control each single LED independently, creating smooth animations, transitions and rainbow effects on the aluminium reflector having the special „PATT“ gold-brown coating.